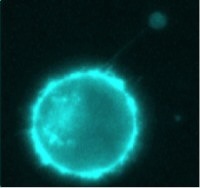 The ability to study and manipulate biological systems at the single cell level is leading towards the possibility of manufacturing artificial cells. The research by Dr Oscar Ces, is leading towards the possibility of manufacturing artificial cells that are capable of performing user defined functions such as sensing and responding to their environment. In addition it allows us to increase our understanding of rare cells such as stem cells and circulating tumour cells. "I have always been fascinated by how cells work and the fact that no two cells are quite the same. Despite the individual nature of cells most techniques rely on population based averages to measure their contents, which means we lose key information about cellular heterogeneity and are limited in our ability to study cells that are only available in small quantities like stem cells. "The analogy I often allude to is that of an alien coming to earth to figure out how the human race works. The last thing you would want to have to do is put the entire human race in a blender to then only be able to make one measurement. What you would want to do is take apart each human and study them one at a time to build up a picture of how we work!”, says Dr Ces.